Well, our first week of doing nothing has been very busy indeed, but packed with proper holiday things just as it should be. The TV has not been on once and although our granddaughter, who has stayed with us for three days, selected a DVD, it never got played! So what has been the magic ingredient to seven days without anything electronic? Well it’s been the dusty board games that have remained unplayed for years! Wow, we had forgotten how entertaining, challenging and aggressive board games can be, particularly with an eight year old. 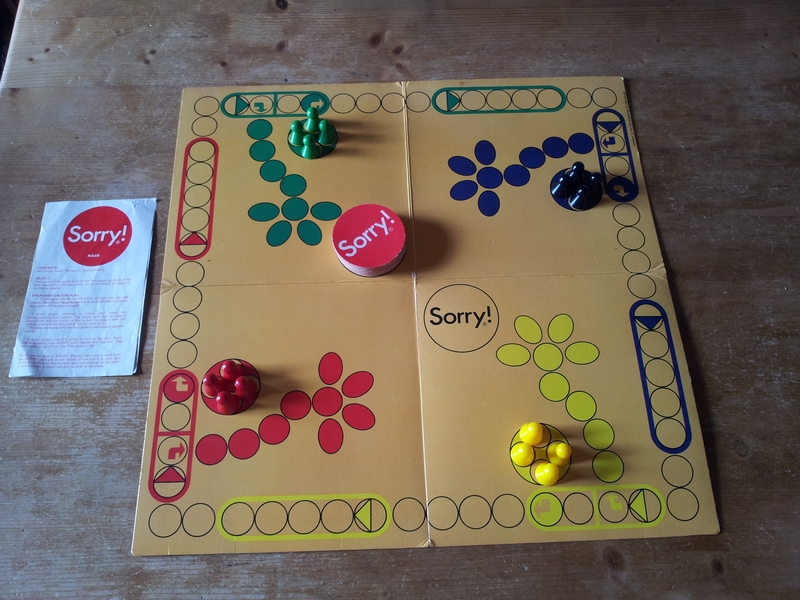 My man actually took the time to read the rules properly on the game of ‘Sorry’ and now it is very much the favourite. We also played ‘The Game of Life’ which has everyone in hysterics when the little plastic cars are filled with blue and pink pegs representing husbands, wives and children. The man’s long face as he lands on a square that says he’s just got married and has had twins, is beyond description. We spent one morning cutting off the damp bits of the boxes that held the games, and replacing them with new bits of card and masses of sellotape. We subsequently discovered that we had a damp wall that needed attention. 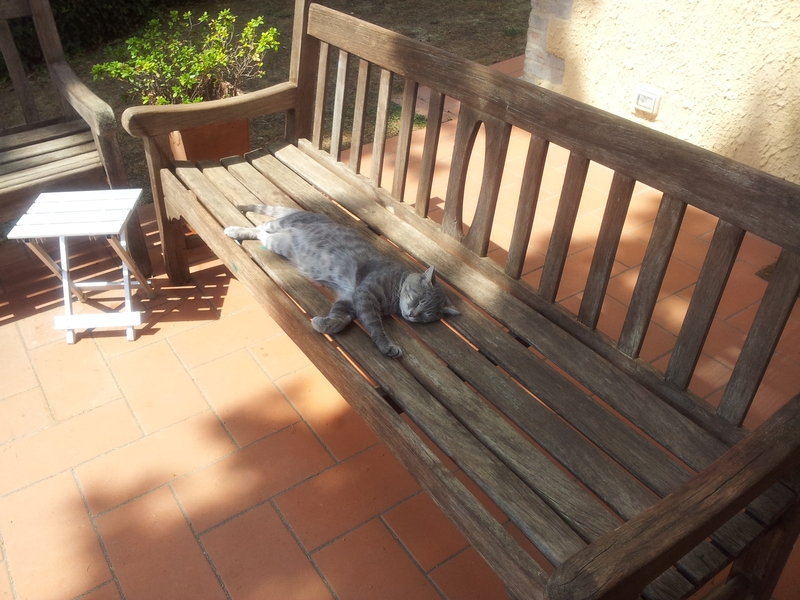 But we don’t care about that, we are still on holiday and so is Farty Barty the cat! We took our granddaughter to an equestrian center on Wednesday, to see the horses and to see if she fancied a lesson. She loved the horses, but was critical about the standard of the stables and things in general, so she declined the offer of a ride that evening. Our girl is already an experienced cleaner of stables and also does circus acrobatics on horseback! So she knows what she is talking about. 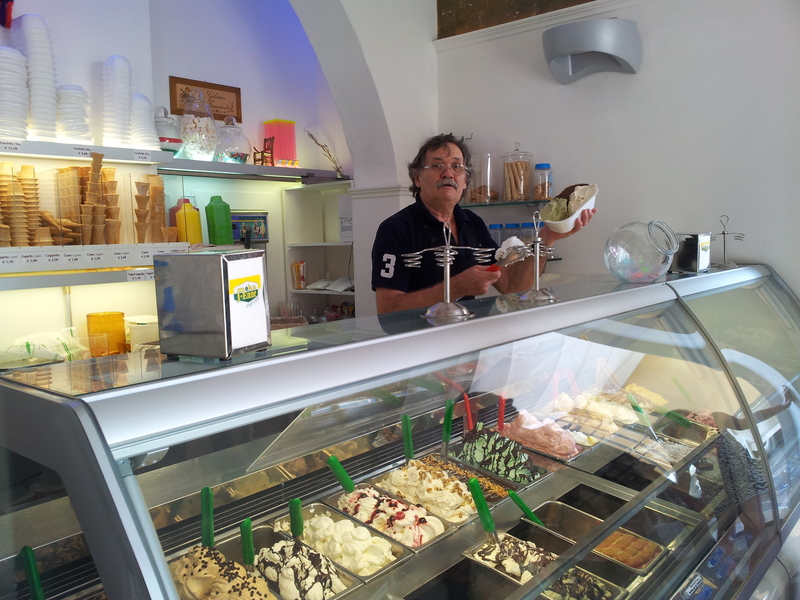 So it was off to Certaldo for a gelato (icecream), which went down really well. In the meantime, my man had developed a rather bloodshot eye after I had poked it with my finger nail. I was just trying to take off the bit of sun block he had left on the side of his nose, then he moved his head! Yes, really, this was not intentional, but it did not help him to rise above the grumpy level. The doctor advised Pronto Soccorso (the emergency department at the hospital) and the man’s spirits lifted when he was told that a few drops would sort him out and his eye should clear in about ten days. The other small miracle, was that we got through the emergency system in just thirty-five minutes! If you ever go to Pronto Soccorso in Italy, you should expect to be there for two to five hours, so we put this speedy visit down to Ferragosto (August holiday when eighty percent of Italians go to the beach or the mountains.) Anyway, afterwards we went for a gelato in Montespertoli and then lunch at C’era una Volta’ in Lucardo. So it was a good day. Earlier in the week we came across a four-foot long snake which was either a Western Whip snake or an Adder, however, the light was not good and we had just driven a few yards down the lane and caught it in our headlights. Have you ever seen a big snake rise up against a three-foot high wall and then jump? Well, this one did and after a few failed attempts finally made it and disappeared! Silvio gets emotional with his girlie in Rome. 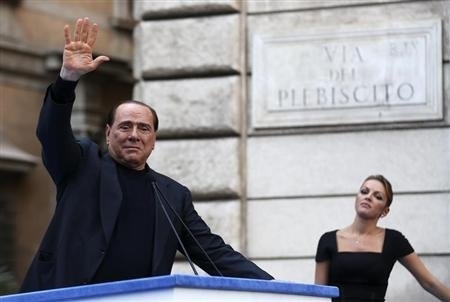 And so to our poor (if very rich) friend Silvio Berlusconi. As we all know, president Giorgio Napolitano declined to give Silvio a pardon. So he is now holed up in his luxury villa with his overage girlfriend, contemplating his navel whilst floating in his huge swimming pool and hoping his support team can still can come up with some way to keep him in politics. On the subject of Silvio’s judicial problems and being allowed to continue to hold office, Enrico Letta (oh, he’s the current Prime Minister) quoted on Wednesday night ‘I will not accept blackmail and neither are ultimatums acceptable.’ Well, I thought this was Italy, was he quoted correctly? Meanwhile, Silvio will not give up and for now will be getting lots of loving hugs from short, fat, aging girlfriend Francesca Pascale (see picture). OK, enough of that. My man is now complaining because I have asked him to download some photos from his smart phone. He is singing at the top of his voice ‘I’m on Holiday, I’m on Holiday’, which is his way of saying ‘you are making me do things when I am supposed to be doing nothing! I shall go and cook him a nice lunch, as we girlies know it is the best way to a man’s heart. He’ll be all smiles again in no time! PS Still not got your holiday reading? Go to http://www.firstchapters.net. I recommend ‘My Father, The Assassin by J W Finnigan. Sounds like a wonderful way to spend your holiday minus the eye hospital (oops!). Fatty Barty looks adorable and my heart bleeds for Silvio- not! Sounds like a great holiday… I’d forgotten how good board games are, we haven’t played any in years. Will have to dig some out now! So pleased to hear that I have encouraged more use of the board games. Not only are they a great family thing, they are fun and can be enjoyed indoors or outdoors, with or without wine & nibbles, with friends and/or children. The list is endless.